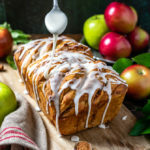 Apple Fritter Pull-Apart Bread. This is one of my most popular easy recipes, and for good reason. 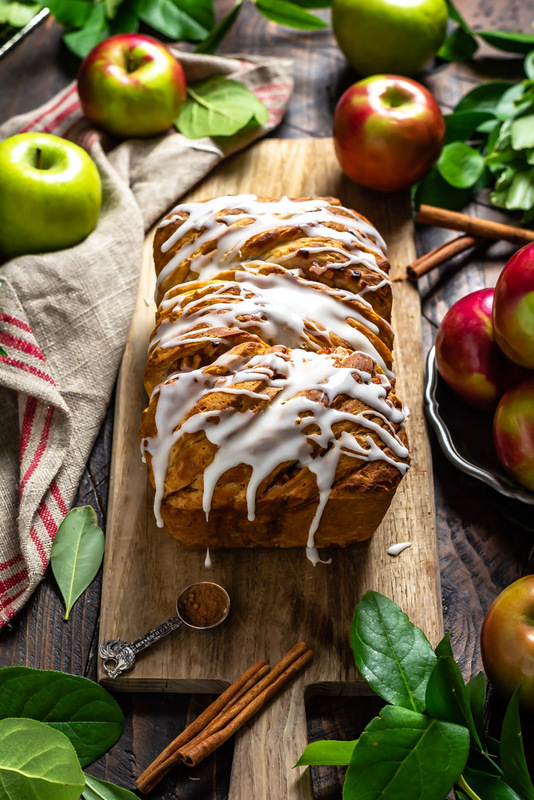 With sweet, fall-spiced apples, fluffy biscuit layers, and a delicious vanilla glaze, this pull-apart bread is always a hit. After making Buffalo Chicken Pull-Apart Bread a few years back (don’t tease me for the bad pictures, that post needs to be updated, too) I became obsessed with the idea of party loaves. 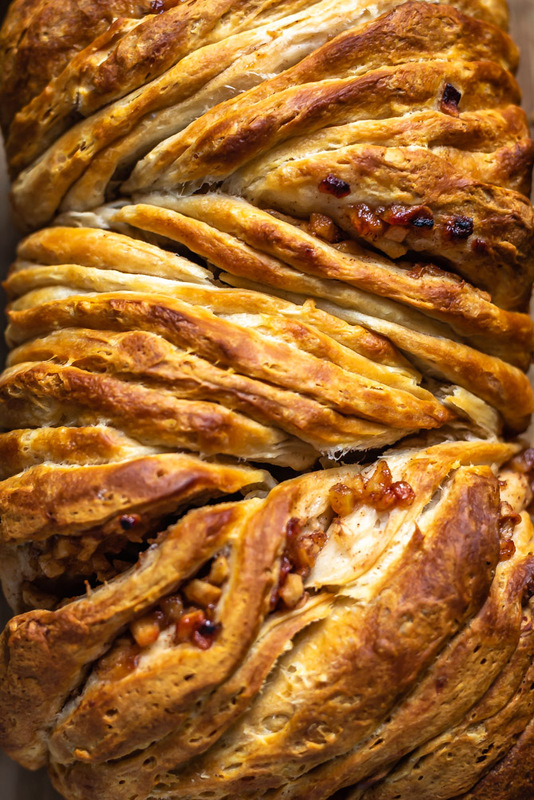 I spent way too much time and filled many notebooks brainstorming ideas for other pull-apart breads, but nothing really clicked with me until I remembered the big brown bag full of freshly-picked apples that were overflowing on my counter, begging to be used up. Apple cider, apple pies, caramel apples, and apple crisps all seemed like great base recipes to transform into a shareable bread, but I nearly fell out of my chair when I remembered the best of doughy apple treats, apple fritters. Those things are brilliant. And while I admittedly had no idea what I was doing when I first attempted to make this bread, I have to say that turned out brilliantly as well. It was so brilliant, in fact, that I’ve been making it ever since, and so have you. Okay, maybe not you specifically (yet), but it’s been consistently one of my most popular recipes every Autumn. Just scroll down and you can see some rave reviews! They say “if it ain’t broke, don’t fix it,” so I was a little hesitant to make any changes to this recipe, but in the years of baking it up for countless get-togethers, I’ve switched things up for the better. These days I use more biscuits and more apple mixture so that the pan is absolutely overflowing with fall-flavored goodness. Trust me, it’s a good thing. 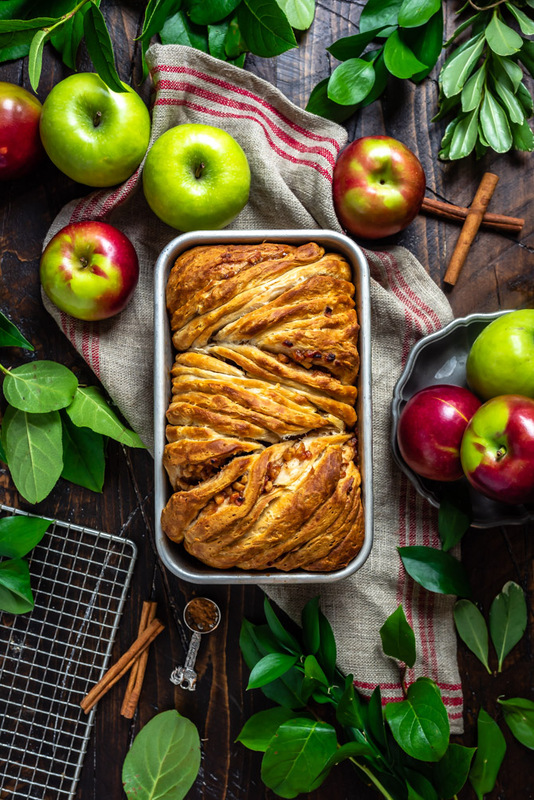 This Apple Fritter Pull-Apart Bread really tastes like apple fritters, but it’s so much easier to make, requires no frying, and is fun to share. 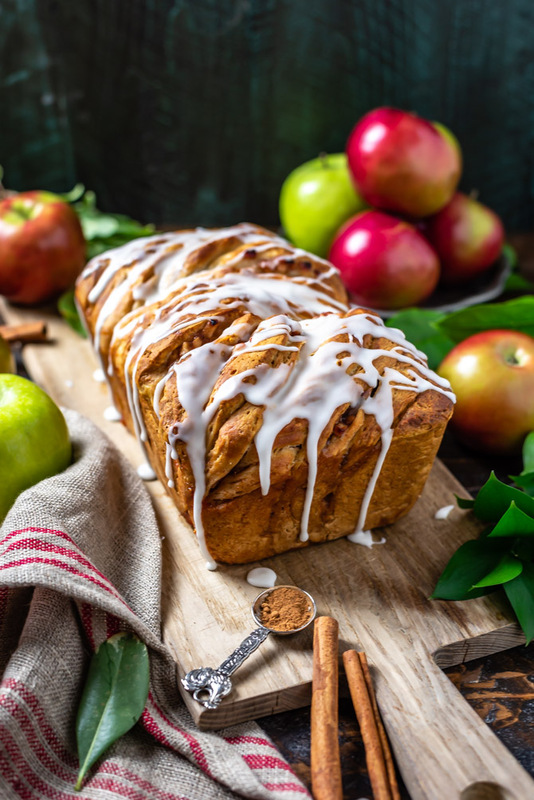 Between the flavorful apple filling, the airy biscuit bread, and the sweet vanilla glaze, this loaf is exactly what you want to be baking up for special Sunday breakfasts, Fall-flavored desserts, or party-picking enjoyment. I mean, just look at these delicious pull-apart sections. No, really look at them. 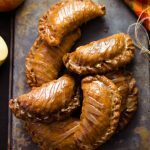 You can see the soft, spiced apple pieces coated in sticky syrup peaking through those flaky, golden biscuits… you can almost taste it, can’t you? 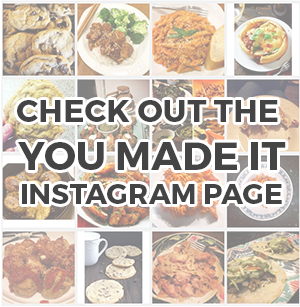 Luckily, as I mentioned before, putting this together is so easy that you’ll be able to actually taste it whenever you want with hardly any effort at all! I know a lot of pull-apart recipes call for making your own dough, and I definitely enjoy a good from-scratch recipe as much as the next person, but there’s nothing quite like a party treat you can just throw together. Here, refrigerated biscuits keep things as simple as possible. Simply saute the apple mixture, spoon it onto biscuit halves, stack them together, and bake it all up! Then top it all with a 3-ingredient and you’re ready to serve. 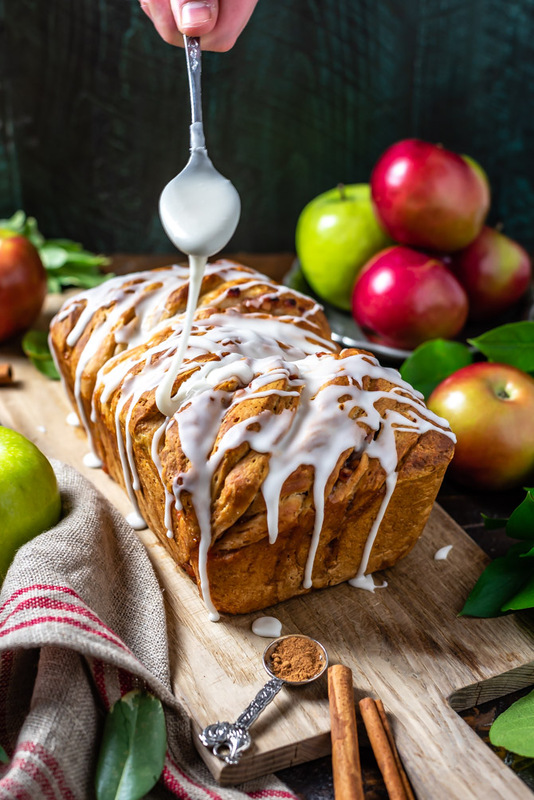 Now you’ve got no excuse not to try this Apple Fritter Pull-Apart Bread out. Go for it, and enjoy all of those layers of appley awesomeness. 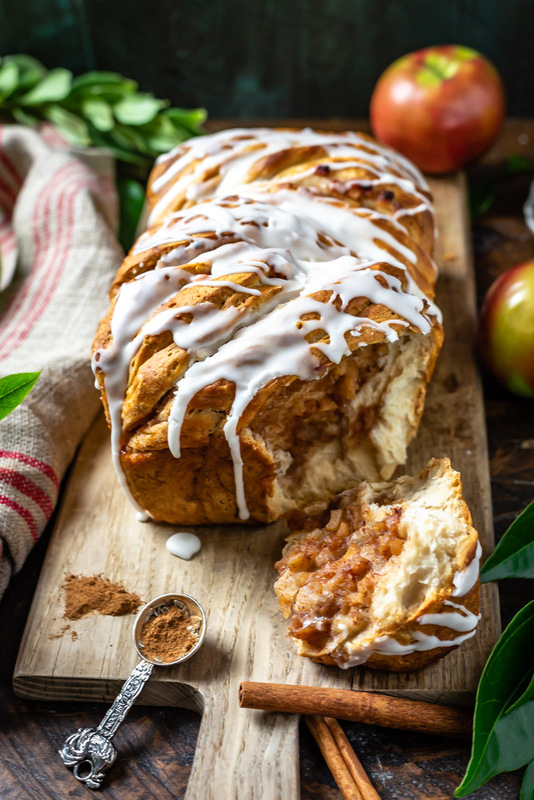 Perfect for breakfast or dessert, this easy-to-make and share Apple Fritter Pull-Apart Bread will blow you away! Add all of the filling ingredients to a large saucepan over medium heat. Cook, stirring occasionally, until the apples have browned and softened and the sauce has thickened, about 8-10 minutes. Set aside to cool. Preheat the oven to 350° F. Spray a 9 x 5 inch loaf pan with cooking spray. Using a paring knife, cut each biscuit in half horizontally to make 32 rounds (you should be able to cut them slightly and then pull them apart the rest of the way). Flatten each biscuit half with your hand to thin them out. 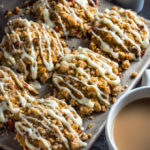 One at a time, spoon about a tablespoon of the apple filling onto each biscuit half, and then stack the biscuit halves on top of one another to form stacks of four with filling in between. Place the stacks in the loaf pan, arranging so that no filling touches the edges of the pan. Repeat until the pan is full (but not too packed, you want to leave room for the biscuits to expand while baking). You may not need to use all of the biscuits. Cover with aluminum foil and bake for 40 minutes. Then, remove the aluminum foil and bake until golden brown and cooked through, checking every 5-10 minutes. Let the loaf cool for 5 minutes and then remove from the pan. Whisk together the powdered sugar and half and half, adding more if necessary to reach the desired consistency. Add the vanilla and whisk again until well-combined. Drizzle liberally over fritter loaf. Serve warm. Pull-apart and serve with vanilla ice cream on top for another delicious dessert option. This looks amazing. I wonder if I could use up my can of apple pie filling (plus extra spices). Any thoughts? I bet you could, just make sure it’s not overly soggy or the bread won’t cook well inside! I really messed up this recipe bc I stacked the bread on top of each other making it from grade biscuits. Then I put the rest of apples on top. What a waste. I don’t believe my bread would of ever gotten done. So plz take me advice watch how you do this recipe. Hey, do you recommend any homemade recipe for the biscuits? Here in Brazil there’s nowhere to buy them. Thanks! Thanks for posting this recipe. It looked delicious so I decided to make it. I found that after cutting the biscuits in half and putting the filling on the slices, it didn’t fill the pan from end to end (used a 9×5 loaf pan like you.) Result: it baked lopsided i.e., one side is higher than the other because the end of the load that didn’t touch the pan slid down. Am thinking next time of filling in the open end with a ball of aluminum foil to take up the extra space in the pan. The balled up foil should be flexible enough to allow the loaf to expand. Would be interested to know if, and how, you were able to fill up your loaf pan with the specific ingredients you listed. Thanks! Frank, I’m sorry to hear that yours turned out lopsided, but hope that it at least tasted good in the end none-the-less! Mine didn’t quite fill the pan from end to end either, but as it baked, it expanded to fit the pan (I tried to center mine as much as possible, which may have helped). The reason I don’t entirely fill the pan is because often times this results in the interior being pressed together too much with the filling and it can cause it to not cook through well. However, if you’d like, give the aluminum foil a go or add another stack of 4 biscuit halves and see if that works any better for you– you might just want to lower the temp a tad and keep it under foil longer. Hope that helps! Thanks, Morgan. I actually thought about adding another 4 biscuits next time too. But in any case, no worries. It’ll definitely all get eaten. It’s delicious! Thanks for sharing. I’ve never made pull-apart bread, but it looks delish! I wonder if the flaky style of canned biscuits would work as well? That’s exactly what I used, Gina! What a great idea, this looks amazing! I love apple fritters so this is right up my alley. How long did it end up taking to cook? Mine took about 40 mins. Very similar to my recipe, but I love that you made it with biscuits…a great time saver! This looks delicious! Would McIntosh apples work? Hi Angela, I’m pretty sure it would taste great with McIntosh apples! If you give it a try, please comment back and let me know what you think! Glad to hear it, Debbie!! I made this this evening and it is superduper tasty! Quick question though, since the drizzle was made with half-and-half do you think I need to refrigerate the whole loaf! Because it was done later at night we only ate a little bit so I’m saving it until tomorrow (Of course that is if I don’t wake up in the middle of the night and attack it LOL) … Thoughts?? I refrigerated mine just to be safe, and I’d recommend doing the same. It might not be a problem if you don’t, but it’s better not to risk it IMO! Glad to hear you enjoyed it, by the way! Haha Desiree, I hope you, your kids, and your husband enjoyed it! I really enjoyed how easy this was but … i cooked it for 45 minutes and it was still raw on the inside… I’m super disappointed in how it turned out . Hi Jennifer- I’m so sorry to hear that. Do you think that you might have used more than a tablespoon of the filling between each biscuit? I know that overfilling would likely cause it to be soggy due to extra liquid, but can’t really think of another reason it wouldn’t cook through. Let’s try to figure this out so that no one has this issue again! My husband loves apple fritters and he also likes to share his food with his buddies at work. Althought this looks pretty easy, I would like to minimize the amount of work I would have to do in the morning. I was thinking about making the filling and cutting the biscuits tonight and have the rest ready to throw together tomorrow. Do you think this is as far as I should go or could I put it all together and throw in the oven tomorrow? Hi Beth! Sorry I didn’t see this right away. I’m not sure how putting it all together and putting in the fridge would effect it, but I’d assume it might have a bit of an effect on the baking time. 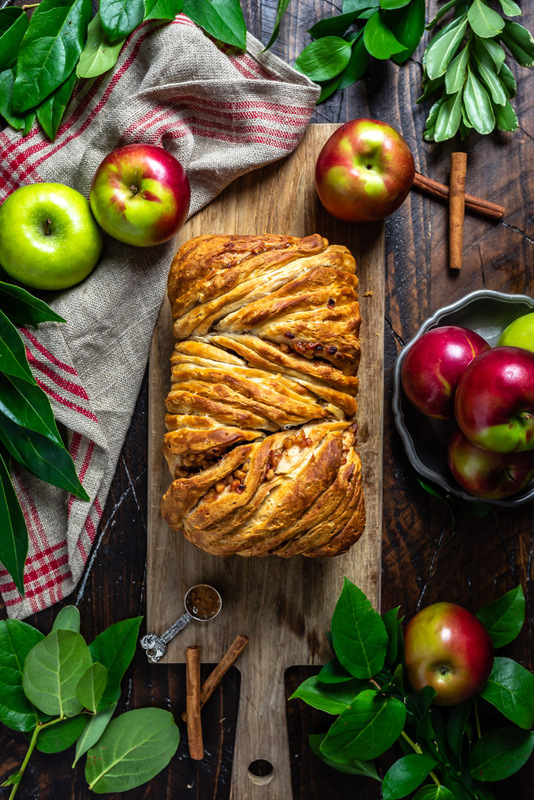 Try to make sure to drain off excess liquid from the apples and cook the bread with foil covering the top for slightly longer than recommended in the recipe and you should be good! hi. This sounds wonderful. How do you think this freezes after it’s been baked. I like to give breads as Christmas presents. This sounds great if it freezes well! Suzanne, I have never tried freezing it. I’d say definitely make a test run first and see how that works out for you before you decide to make them in bulk for gifts! Just made these this morning for a girls lunch/play date. They were an absolute hit! East to make, beautiful presentation and SO delicious!! Thanks!! Happy to hear it, Deborah! Do you think I can freeze this before (or after) baking and then thaw for later use? Bonnie, I’ve honestly never tried doing that. I have heard of people making pull-apart breads, cooling them to room temp, wrapping them well, and freezing them, though. If you do that, take it out long enough to thaw, wrap it in foil, and then reheat in an oven set to 350 until warmed through. Hope that works well for you! Let me know! This was so delicious! I made the apple filling the night before and then assembled right before baking. My bread turned out perfectly shaped and cooked through. I will definitely add this to my “company breakfast” rotation! Thanks for sharing this recipe! Could you freeze this bread? Please, please try to come up with an alternate to all this sugar! Could this be made with Stevia or honey? 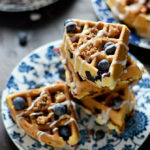 I’m going to add pecan pieces when I make these. Sounds and looks delicious! making this today I could only find the big biscuits is that okay? Could this be made with frozen rolls, let them unthaw and press and then put the apple filling on? i added a turbine sugar and cinnamon topping to the pan before baking, it added a lovely texture. then I put on the vanilla glaze! Made this with frozen grands that were thawed in the car and than refrozen into a big mess. I set them out at room temp. until I could cut them and flatten like the directions said. Excellent and easy. 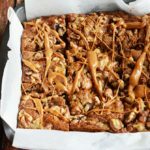 There are no nuts in the recipe but you can add some if you’d like!